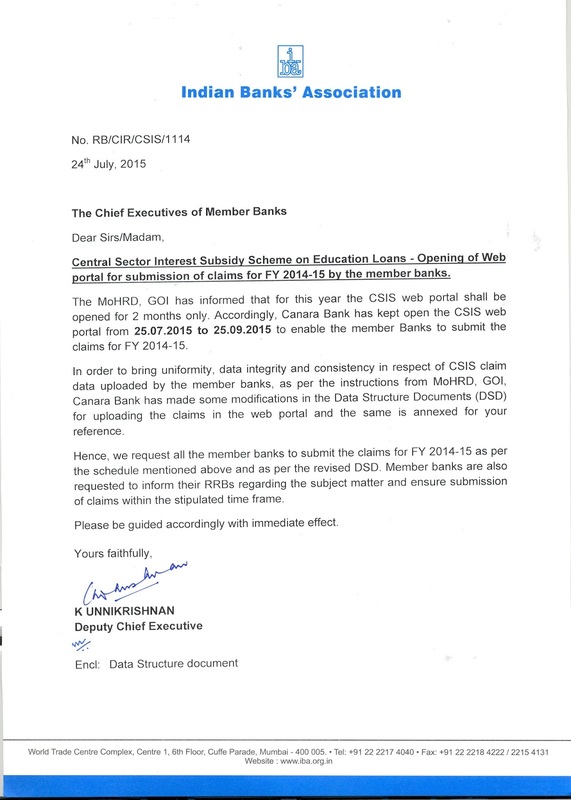 All Bank Branches should submit the interest subsidy claims for 2014-15 before 25th September 2015. Though it is the duty of all the branch managers to submit the claim to the nodal bank Canara Bank before the due date, in the past, due to various reasons, managers have not submitted the claims properly. This has resulted in many eligible poor students not getting the interest subsidy from the Government. Students who have availed education loans under IBA Scheme pursuing professional or technical courses in the approved institutions and whose annual parental income is less than Rs.4.50 lakhs are eligible for 100% interest subsidy during the moratorium period. They should have submitted the income certificate duly signed by Thasilldar. Eligible students may meet the branch managers and get the confirmation that the Branch has included their name and the exact amount (100% of interest charged during 2014-15). The students can also submit a letter to the Managers seeking confirmation for having submitted the claim. They can endorse a copy to the concerned Regional Managers and the Branch Managers. We are suggesting this as an abundant caution. If the Branch Managers refuse to give proper information, the students can write a complaint to the Chairman of the Bank and to the Regional Manager.